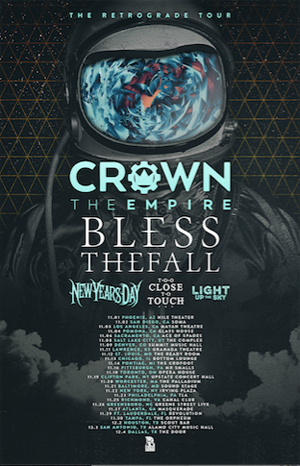 NEW YEARS DAY have announced their latest touring plans for the Fall, which will see the group join on as part of "The Retrograde Tour" headlined by CROWN THE EMPIRE. The upcoming trek in North America will be the band's first back in the US since hitting the road with HELLYEAH earlier this Spring. NEW YEARS DAY have spent much of 2016 touring in multiple countries on the strength of their new album, Malevolence. In addition to the upcoming tour with CROWN THE EMPIRE, NEW YEARS DAY has released a new live video for the song "Your Ghost", which was filmed during the band's tour in Europe supporting MARILYN MANSON earlier this year. The new video was directed by Eve Saint Raven and can be seen on KNAC.COM right HERE. “This was such an amazing time in our lives. We were able to tour with our absolute favorite artist on the planet and experience the taste of playing shows in arenas. It’s a rush that is hard to explain into words but this video helps explain the feeling a little bit"